A business is the people who run it, and stops on focus, quality, and creativity can halt progress altogether. With this in mind, a functional working space is arguably the most crucial element to a success. Yet, while it may be idyllic to have a beautiful private office with a massive glass wall and a door allowing you and your employees to get down to business, it isn’t cost effective. Perhaps you’re a fledging startup business who has, up until this point, relied on your couch, pajamas, and laptop for your main center of business, but are looking to branch out. Perhaps you’re an already established small business looking to downsize on the cost of your personal and employee office space. In both these cases, something as simple as a shared office can offer the solution, cutting down on costs and even boosting your productivity. Here are four ways how: 1. Savings on Leases and Amenities You get what you pay for. Large and elaborate office buildings often come with a price tag to match all of its advantages, while a smaller area offers a significant drop in the price range. This may lead you to think a smaller place equates a drop in quality, but on the contrary, with so many small businesses forming, many landlords are creating office spaced designed to be minimalistic but highly functional. An open-flow office style that incorporates rows of desks rather than individual cubicles allows owners to group employees more efficiently, achieving the same purpose but within a reduced area. - Personal Office Office spaces aren’t reserved just for businesses. A small business as a title can be applied even when the owner is the only employee, and while this advantage certainly leaves you with fewer expenses for salaries and overhead, the price of a personal office could put you under. A shared office, otherwise known as a co-working space, can be compared to a roommate agreement – only with more focused work and less surprise frat parties. By splitting the price, you can receive the largest value for your expense. - Employee Workspaces For businesses with more employees, renting an entire office building means more than the rent – amenities must be considered as well. By taking advantage of a shared office space that essentially fits five offices into two, expenses on electricity, air and heating, and a range of other needs will be reduced. 2. Collaboration Every business owner understand that saving money is more than just cutting on costs; it’s taking away the roadblocks that keep you from making money. 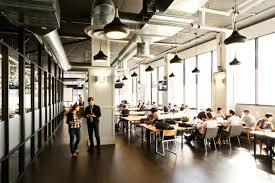 A shared office offers co-workers as well as independent office-mates an opportunity to communicate and collaborate. - Personal Office While the person you share a working space with may not be a part of your business, most entrepreneurs of the same field are attracted to the same style of office for its location, amenities, and price range. This means while you may not directly collaborate with your sit-in “co-worker,” you may be able to exchange ideas and advice within your fields, delivering insights or assistance during times of struggle. - Employee Workspaces Each employee works different, yet studies have shown that certain business types in fact benefit from an open-flow office style that allows employees to communicate, collaborate, and share insights – and on more than just office gossip. By encouraging this interaction, productivity and the quality of the service could be improved, not only saving you money but in fact making you money. 3. New Business Opportunities Some of the most profitable business opportunities come from chance, and while a secluded office offers the advantages of privacy and fewer distractions – namely that worker with a voice of thunder – it also isolates professionals from the real-time market and potential business partners. Saving money can mean eliminating roadblocks or barriers that have been restraining your business, and a shared office space can offer you that unique chance. - Personal Office A shared office space offers the opportunity for meeting the most unexpected people. You may end up sharing a space with a professional from an entirely different field, and even if it does not directly benefit your business, they can offer you insights and advice from diverse fields, giving your respective businesses an edge. - Employee Workspaces To save on costs, even small businesses with several employees can share a joint office with another business. This opens the opportunity for direct collaboration amongst several fields, so that a tech company can quickly arrange for marketing expertise or graphic design from the professionals working across from them, making both businesses money while saving on costs. 4. Professionalism Marketing campaigns and a range of other tactics for drawing in customers have great expenses for businesses, but a shared office can help dampen these costs. It does it with one word: professionalism. If your business looks professional, customers and business partners will be drawn to you, allowing you to tone down your marketing efforts and save money. - Personal Office We all want to work at home for that lovely chance to handle projects in our pajamas, but it does little for professionalism. Having an office shows a level of commitment and dedication to your business, offering you a base for inviting in business partners, customers, investors, and other individuals who are valuable to your business. Better yet, having a shared office can help you maintain that personal, comfortable persona – doing more than helping your bank account by in fact generating business. - Employee Workspaces A shared office not only boosts productivity and saves on costs, but it sends a message to customers, investors, and business partners. It shows that your business is both frugal and capable of strong collaboration, with a dedication to productivity and profits over the style of a larger office. This edge can be the deciding factor between you and your competition. Businesses everywhere are looking for new and creative ways to not only save money but to also boost profits. A simple shared office space can offer this opportunity to independent workers as well as small businesses, all with a few simple changes.